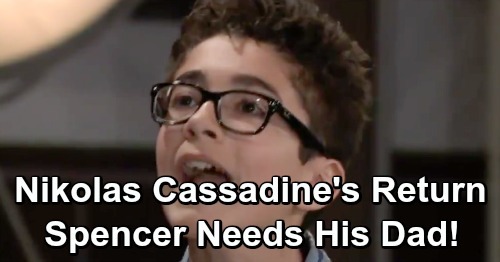 General Hospital spoilers explain that GH needs to something about one precocious Cassadine sorely in need of his father. Spencer Cassadine has been a fan favorite for years, but under the supervision of his grandmother, he has become entirely obnoxious and needs to be taken in hand. Spencer needs his beloved father back to guide him and get his back under control. General Hospital’s Laura Webber (Genie Frances) is the mayor of Port Charles. Laura is dealing with trying to help capture Ryan Chamberlain. Laura’s marriage is crumbling. Lulu Falconeri (Emme Rylan) is out of town and Laura is trying to spend time with Charlotte Cassadine (Scarlett Fernandez) is her absence. Meanwhile, her presumed orphaned grandson is overlooked while the head master at his school is expected to keep him under control. Laura should not be Spencer’s guardian in the first place, he needs someone more attentive to his needs and she simply does not have the time. General Hospital’s Spencer Cassadine is never at school. Spencer leaves school on a whim and leads the jet-set life of a reality tv star. Laura never knows when Spencer leaves school or when he will arrive in Port Charles. Spencer constantly travels alone on international flights, and anything could happen to this child on one of his excursions. What is worse is that Spencer is never punished for anything he does so he never learns from his mistakes. Spencer has already committed election fraud because General Hospital’s Laura does not supervise this child. Spencer is far from being an adult and making adult choices, yet he continues to get in over his head time and again. Spencer was no saint when his father was alive, but he certainly did not get into as much as he has with Laura and Nicholas corrected his actions, unlike Laura. Spencer is out of control and needs someone to take over and teach him right from wrong. Nicholas had crossed the line when he disappeared but would never be ok with Spencer being a criminal. Nicholas always paid attention to Spencer and was there for him; Spencer needs that now. General Hospital’s Nicholas needs to return to protect his son from Valentin’s threats and Laura’s incompetence. Spencer does not need to grow up to be a criminal, and Nicholas needs to teach him that. Nicholas should come home sorry for his sneaky ways as well and teach his son to do better. Spencer needs a parent he can depend on, not a grandmother who lets him get by with murder. Nicholas Cassadine is needed onscreen for his son. Even if General Hospital executives have to recast the role of Nicholas Cassadine again, he needs to be available for his son. Tyler Christopher and Nick Stabile were both great as Nicholas and either would be an asset to the cast. Come back to CDL often for all your General Hospital spoilers and news! General Hospital Spoilers: Will Laura Divorce Kevin Over Devastating Ryan Betrayal – Can’t Get Past Lives Lost and Lulu’s Horror?